So-so on the health factor I suppose buy YeeHaw! on the Yum-o scale. I'm hosting the Mardi Gras party this year so I've been looking around for some new Cajun recipes. Tonight I decided to try three new dishes: Shrimp Po' Boys from Cheap. Fast. Good! by Beverly Mills and Alicia Ross; Cajun Black Bean Soup from the Bush's Beans company website; and Grilled Chicken and Cheese Po' Boy Sandwiches from About.com. Actually the Grilled Chicken Sandwiches were fairly healthy with their gilled chicken breast and light mayo. I cut down quite a bit on the cheese and only used one slice of provolone and a sprinkling of Gruyere that I had left over from the holidays. Whole grain bread and more veggie toppings could make it even healthier. The Black Bean soup was pretty healthy (and tasty) with lots of protein and fiber. 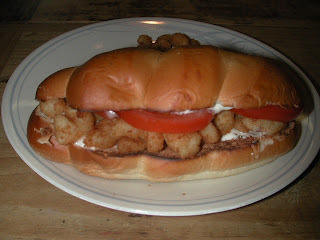 My Shrimp Po' Boy, full of deep fried popcorn shrimp? Not so much but boy was it delicious! In an attempt to make it a little *less* bad for you, I did bake the shrimp rather than fry them and in the future I'd use cocktail sauce rather than tartar sauce because I personally don't care for tartar sauce. I prepared the entire meal in less than 30 minutes. All three dishes were simple to assemble and made from things I already had on hand in the freezer or pantry. All three recipes are definitely keepers! Microwave or bake the shrimp according to package instructions. Spread a heaping tablespoon of tartar sauce over each half of the buns. (The buns can be toasted first if you prefer.) Place 12 to 15 cooked shrimp (they're small) on the bottom half of each sandwich bun. Top with a lettuce leaf and a tomato slice, if desired, and cover with top half of the bun. Serve at once. Preheat grill for medium-high heat. Season chicken breasts with salt, pepper, and garlic powder. Place chicken on lightly oiled grill grate and grill for 6-8 minutes on each side. When no longer pink and juices run clear, remove from grill. While chicken is grilling, place two slices of swiss cheese, provolone cheese, and some Parmesan cheese on one half of each bun. Place bread in the oven for 5-7 minutes, or long enough for cheese to begin to melt. Remove from oven, place mayonnaise, garnish, and chicken breast on bread.